AFTER 500 PAGES; THAT’S IT? I think, so far, I prefer PJO. This series, so far, hasn’t had something actually happen. 1. Juno/Gaia –TBH any goddess, are being a pain. 3. Both trios go on quests, but there’s no strong bad-guy for it to be intense. They had to have more humour or drama to be more interesting. (Which they weren’t, sadly) both quests kinda felt pointless, and the true importance was that the male protag concluded they’re from the other camp… great. Why did it have to take 500 pages? To build a relationship to the new camp/trio? Not worth it, Riordan! I enjoyed having Percy back. I didn’t enjoy having the absence of Percy’s memories and friends. Hazel was too much like Piper. I don’t know if this is because they’re supposed to be parallels of each other or if Rick can’t write original female perspectives (which could be understandable if he weren’t such a well acclaimed author with several credentials). Frank was precious and if I’m honest, his chapters are v chill and boring for Riordan’s tales, but he was relatable in his teen angst and self confidence issues. He has such a pure spirit, I really hope he survives in this story. I NEED PERCABETH… WHERE THE HECK IS MY PERCABETH. RIORDAN FINALLY GETS THEM TOGETHER AND IMMEDIATELY RIPS THEM AWAY. WHY MUST I LIVE THROUGH THIS. I’m really not looking forward to reading about Piper and Jason again… they were too whiney and 2 dimensional. I think Leo would fit in well with the Camp Half Blood gang, though. Besides the characters, I don’t think I actually like the set up of the Roman mythology. Maybe it’s because I studied it for such a long time at school, or maybe I simply just like how Riordan portrays the Greeks. 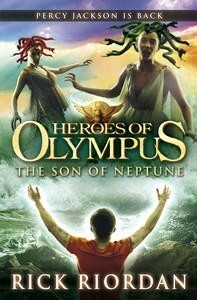 So far, the Greek mythology has become so lively and cool. There was a moment in this book where Percy is taught the “war games” they practice, like extra hard Capture the Flag. Except they make all their games based on team work– like how the Romans practiced. When I read that, I couldn’t help but roll my eyes. Let me see some heroic Percy, damnit!!!! I don’t care for their shared victory. This probably reveals a lot about my own character and how I perceive the world, but eh- sorry not sorry. I want to see Percy being the one to rule the prophecy. Not some lame Roman demigods who believe that trust exercises and team work will lead to the win. It’s boring. I wanna see the underdog fight the impossible, with their buddies by their side. Have I seen this in the last series? Yes. Is it cliche? Yes. But what is Riordan’s stories if they’re not predictable and cliche??? It’s half the fun. I probably wouldn’t read this instalment again.